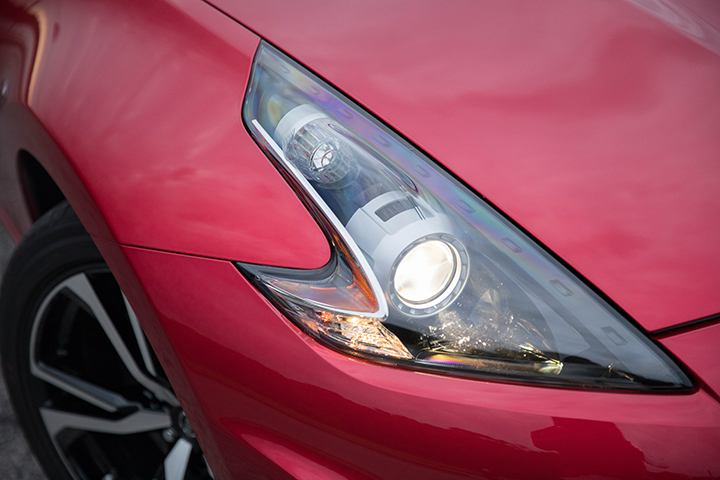 The 370Z Roadster’s iconic exterior design incorporates the signature Z long nose/short cockpit proportions. 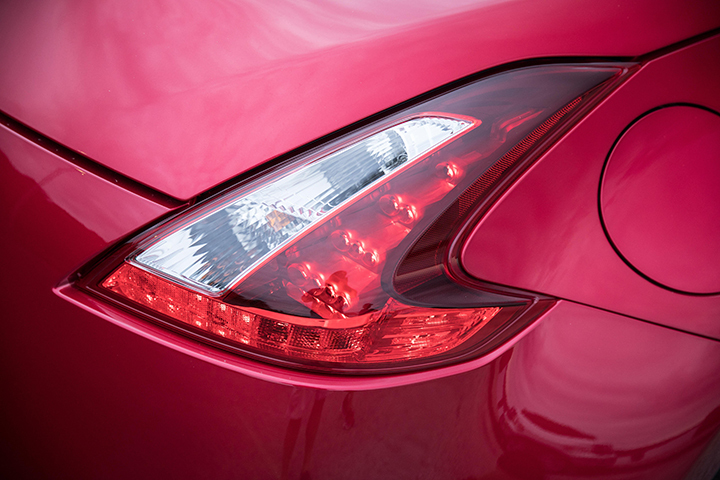 The distinctive headlight/taillight treatment features an aggressive boomerang shape. The headlights are a High Intensity Discharge bi-functional xenon design with auto on/off feature and integrated LED daytime running lights with a dark headlight treatment. Other features include dark tinted rear combination lights, black-matte chrome-plated outside door handles and blackout rear fascia. 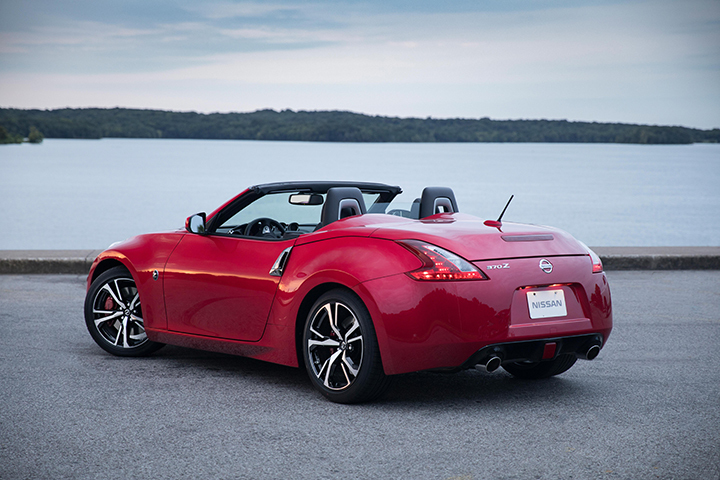 Core to the appeal of the 2019 370Z Roadster versus the 370Z Coupe is the exhilarating sensory experience of an advanced fully automatic convertible design. The 370Z Roadster’s power automatic latching top was designed with an emphasis on providing a sleek silhouette with the top up or down. With its easy single-action open-close operation, it provides an enjoyable top-down experience with reduced wind turbulence and all-climate driver passenger comfort. In the closed position, the top design imparts a sophisticated sloped-back appearance, the ideal balance between the soft top and the 370Z body design. The shortened windshield and aerodynamically rounded rear deck enhance the Z’s kinetic and dynamic character lines. 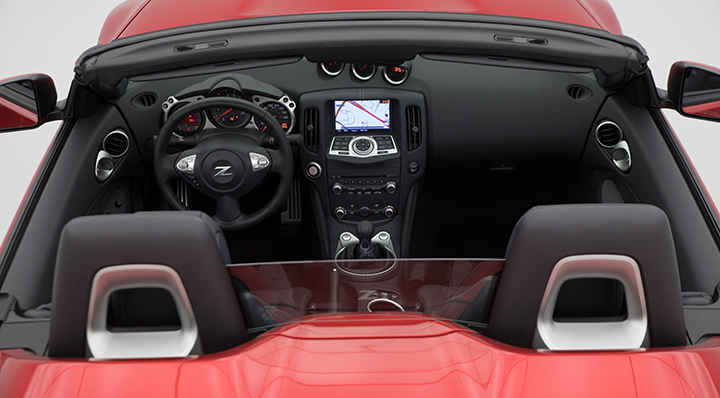 When in the down position, the convertible top is concealed beneath a full body-color hard tonneau cover, which extends forward to help create the 370Z Roadster’s classic double cockpit style interior. The standard black cloth convertible top features a fabric inner liner, which provides a quality appearance and helps reduce noise intrusion into the cabin, along with a large glass rear window with an integrated electric rear window defroster. The top operation takes approximately 20 seconds and is controlled by either a center console-mounted switch or by a button located on the doors. The automatic latch system secures the top to or releases it from the windshield header without driver intervention. The shape and position of the glass wind deflector, located between the fixed headrest bars, has been optimized to help reduce turbulence into the cabin. Three exterior colors are offered for 2019: Magnetic Black, Pearl White and Passion Red. The Passion Red paint process uses a high brightness aluminum pigment in the base coat and Nano-pigment tinted clear coat to give it a vivid, jewel-like red color that looks different depending on the viewing angle. Inside the 370Z Roadster is an interior that is completely driver-centric, with its three-layer design grouping items by how a driver sees information, operates the controls and is held in place so drivers feel completely connected and engaged whenever and wherever they drive, top up or down. 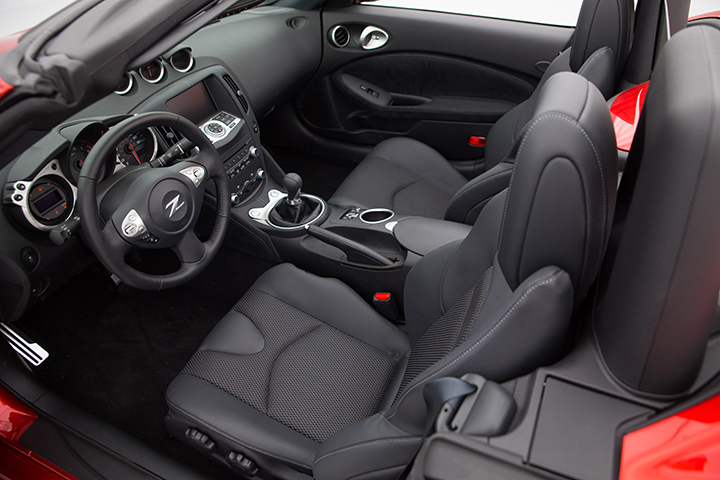 The 370Z Roadster’s 2-seat layout includes a deeply scooped instrument panel with a full-length center console separating the driver and passenger’s seat. The instrument panel retains the traditional Z 3-pod cluster with oil temperature, voltmeter and clock, while the speedometer and tachometer include an initial sweep function, coming alive when the car is first started. Standard interior comfort and convenience features include auto-dimming rearview mirror with Rear-View Monitor, Nissan Intelligent Key with Push Button Ignition, Bluetooth Hands-free Phone System, power windows with one-touch auto up/down feature, power door locks with auto-lock feature and a center console box with a nonintrusive cover design. Other features include automatic climate control, two 12-volt power outlets, three cupholders and an AM/FM/CD/AUX 6-speaker audio system with illuminated steering wheel-mounted controls. The steering wheel is an oval 3-spoke design, which offers baseball-style stitching and large thumb grips/palm rest areas for improved feel on long drives. The surface of the leather-wrapped wheel is shaved to provide a more kidney-like shape to better fit in the hand. An unbeatable combination for 2019, the 370Z Roadster continues to offer one of the most advanced drivetrains available for affordable sports cars today. The long list of cutting edge performance focused technologies includes a standard 332-horsepower 3.7-liter DOHC V6 engine with Variable Valve Event and Lift Control. The VVEL system is able to optimize intake valve open/close movements, allowing the needed air to be sent promptly to the combustion chamber at the precisely optimized time. Since the VVEL system can adjust to open the valves slightly, it improves fuel efficiency by reducing camshaft friction and fuel waste. It also provides cleaner tailpipe emissions by allowing for quicker warm-up of the catalyst and by stabilizing combustion when the engine is cool. The standard 7-speed automatic includes Downshift Rev Matching and Adaptive Shift Control and is designed to offer quick, manual-like shifting when operated in manual mode. Drivers can use the standard paddle shifters or the shift lever. The 7-speed’s wide gear ratios enhance fuel efficiency, while the Adaptive Shift Control is designed to adjust to the driver’s driving style. 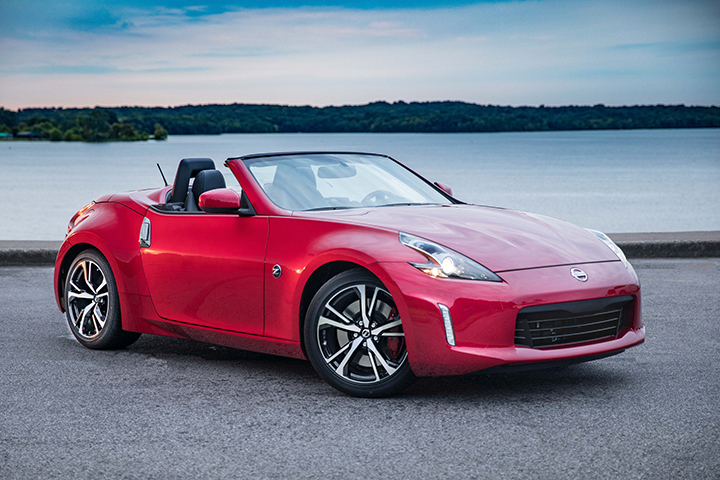 In addition, the 370Z Roadster utilizes the Z Coupe’s advanced 4-wheel independent suspension. The double-wishbone front suspension uses lightweight forged aluminum arms and a lightweight rigid aluminum-alloy cradle, along with a hollow construction stabilizer bar. The 4-link rear suspension integrates the rear cradle into a single part. High response shock absorbers are utilized on each corner for enhanced ride comfort. Under the skin, the legendary 370Z driving experience has been enhanced through optimized acceleration and torque profile tuning. Without changing the engine’s internal structure or components, also the convertible top features an easy, single-action open-close operation. The interior is completely driver-centric, with its three-layer design grouping items by how a driver sees information, operates the controls and is held in place so drivers feel completely connected and engaged. Fuel economy is rated at 18 mpg city and 25 mpg highway for the 2018 Nissan Roadster Touring Sport with the standard 7-speed Automatic Transmission. The manufacturer’s suggested retail price starts at $49,400.00, the one I drove included the passion red exterior premium paint ($695.00), carpeted floor mats ($130.00), cargo mat ($100.00), and it came in at $51,210.00 including destination charges (885.00). Posted in CAR REVIEWS, Nissan.